A specimen of the dinosaur Microraptor, preserved in volcanic ash, has served up some new dietary clues. A particularly well preserved specimen of the dinosaur Microraptor found in China has given paleontologists a tip off that their previous knowledge of Microraptor's diet was a bit fishy. Microraptor, a predator the size of a hawk, had four wings in a biplane arrangement. It would have been able to take short, controlled flights around its arboreal environment to catch small birds and mammals - and, apparently, fish. The fossil, a very complete skeleton with an unfortunately crushed skull, had a variety of fish bones in what would have been its stomach. Indeed, the paleontologists analyzed Microraptor's teeth in light of their new knowledge, and found that they were only serrated on one side. Scott Persons, a graduate student at the University of Alberta who was involved in the study, said that "Microraptor seems adapted to impale fish on its teeth. With reduced serrations the prey wouldn't tear itself apart while it struggled. Microraptor could simply raise its head back, the fish would slip off the teeth and be swallowed whole, no fuss no muss." This find is the first evidence that a flying raptor would have successfully preyed on fish. Because the specimen was preserved in volcanic ash, the fish bones survived. Among the bones were pieces of fish rib, vertebrae, and skull, all worn by powerful stomach acids. Persons told Science Daily that "We were very fortunate that this Microraptor was found in volcanic ash and its stomach content of fish was easily identified. 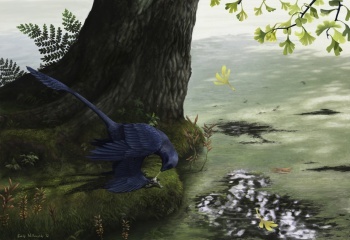 Now we know that Microraptor operated in varied terrain and had a varied diet." In the early Cretaceous period, 120 million years ago, China would have been wet and forested, with many lakes. Not enough science for you? We understand. That's why we serve up a weekly dose of the Geekend Update.